When LG showed off the first curved 3D OLED screen at CES earlier this year, it was sure exciting—but seemed unrealistic as a commercial venture. Now, though, LG has announced that it's planning to sell the curvy TV. I just saw a crazy setup of three of these 55-inch beauties aligned side-by-side into a perfect cinematic curve. The effect is very dramatic. 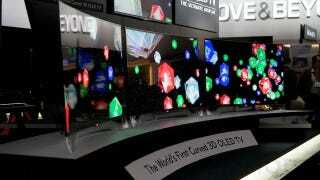 This could be the whole reason 3D and curved OLED exist... The content doesn't pop out at you the way some people imagine 3D. Rather, the panel's curve pulls you in. With three lined up into a mega curved 3D OLED, the immersive effect is even more intense.